I was feeling a little vulnerable and sad a little while ago, full of self-doubt about my skill. What a horrible feeling. I wish I could be free of it for at least one day a week! Alas, alack, etc. I saw this beauty by Sofia Barão posted on A Cup of Jo today and felt the vintage lace lust. It was inexpensive, and the words "beautiful white and antique pink vintage lace that I will never be able to find again" made it absolutely irresistible to me... & so I bought it and instantly felt better. Funny how things work that way! I didn't buy anything this weekend except a few meters of gorgeous dusty-rose sequin trim. I am in love with it. I am a lace girl, I am a dusty-rose sequin girl. I am not sure how I will combine the two, but I will certainly try for something pretty. Or maybe I will just look at it. No no no how could you feel like that? You make so many beautiful things and haven't you seen all the comments about your needlecase?! And your lovely dresses...you are very skilled and should enjoy very much what you make. 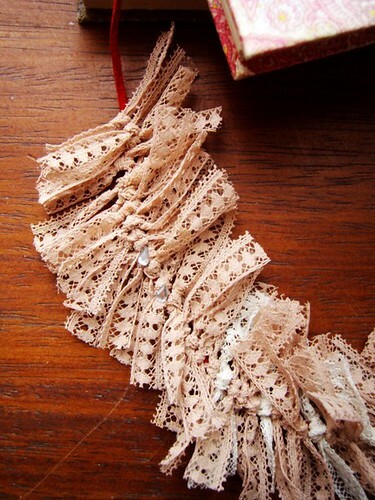 The lace is lovely by the way as is the shop it came from, I havent come across it before. i think a feeling we all struggle with, i know do at times anyway. this morning, they made me smile. will you hear the bells from where you are? Thanks, all of you. It's pretty self-indulgent to feel that way, I admit, but I just can't help it from time to time. It is too easy. I may, Nikole... I am not too far from Queen's Park at the moment. I understand those feelings. I think everyone gets them, self-indulgent or not. It is okay to feel that way. And when you do, you can count on this wonderful community to pick you back up again.